1, 2 Graduated Design Department, Dongseo University, Busan, Republic of Korea. 1 University Kuala Lumpur, Kuala Lumpur, Malaysia. 3 Faculty of Applied and Creative Arts, Universiti Malaysia Sarawak. This research investigates the observation of Malaysian youth, to understand on how they feel about Malaysian animated film characters. This paper will highlight the design aesthetics of the characters and factors that affects emotions among Malaysian viewers. In this study, a correlation statistical test will be used and respondents comprised of 104 youth from Peninsular Malaysia age between 20- 27 years old to categorize the perception of Malaysian animated characters. Results indicates that correlation between variables are moderate (r =.306) and (r = .282) but shows high significant values (p < .05) which mean the possibilities of Malaysian animated characters is appealing and attractive is true and give a pleasantness feeling to the Malaysian viewers. Animation films has played an important role in entertainment contents that influences many people in any respective society. Having a good animated film, create cognitive and conative response to the animation viewers and its potential audience. The importance of animated character in animation film also supplements the animation contents in which indirectly affect the emotion of the animation viewers. Animation is a pop culture that aroused significantly from Disney and Anime. They are the key influence for many animation moviegoers around the world. It has not only inspired the style and animation art form but it also affects the humanity and lifestyle . In this study, we explore the empathy on how Malaysian animated characters has affected and induced the feeling of the Malaysian animated film viewers. Empathy research is a growing field nowadays with an abundance of studies ranging from philosophy and psychology. The term refers to everything that is connected with the relationship between memory and emotion, a topical matter that filmmakers approached, consulting with neuroscientists and psychologists . Therefore, we will investigate the perception and the design aesthetics that affects the psychological experiences in emotions to recognize empathy among Malaysian animation viewers. This paper explains the role of visual appearances in Malaysian animated characters and how its strategic creation able to stimulate the sensory perception of pleasure and excitement. We argue that it is highly likely that the character designs in Malaysian animations visual reinforcement has become one of a cinematic tool, and plays an important role to connect with the audience. It represents a way that empirical experience accumulated by the audience and will draw upon an evidence that reflect their human perception and cognition. The creation of character design in animation is closely related to many aspects in human society. The process of designing the animated character has become an important process not only for visual but also bounded to many specifications that advent from myths and legends and inspired from society throughout centuries. From the development of the storytelling in animation, designing good animated characters requires a coherent and consistent character design skill and the artist need to consider many restrictions to develop suitable characters in the story. Most of the successful animation films are inspired from myths, fantasies, lifestyle and superheroes from storybooks or comics that are being visualized through the art of digital animation [3; 4]. Designing a good game or movie character requires more than only having an idea nowadays. Creating an appealing character design in animation has been both a distinct challenge as well as a space for exploration for animators throughout animation’s history. It is through the Character Design that physical and psychological characteristics are presented; giving the character depth and making it connects with the audience . As described by Bryan Tillman , in order to achieve a satisfactory result, a character designer needs to combine different elements in character design. These elements are the psychological and physical aspects of the character and the story that revolves around it. Other importance aspect is the elements of shapes and colors, the significance of these factors may have an indirect impact on the emotion of the viewers. Sajjad agreed that design and color in animated film is very significant in order to portray a specific mood or emotion to the audiences . In Malaysia context, culture plays an important role that affect any media contents. From the history, famous traditional culture ‘shadow puppet play’ or ‘Wayang Kulit’ has been around for many years. It is a traditional Malaysian theater staged opera which combination of verbal narratives and performing arts . It was believed that Walt Disney learnt the ‘shadow play’ before coming out with his own animation . Animation is also a creative way to preserve culture with computer animation to portray stories and tales about any given society. Storyline is the most essential part in any development of animation contents. Visual culture in some ways influences people’s knowledge, affects their construction and shape their aesthetics sensibilities. Beside the storyline, character design has become a backbone of successful animation. Character design developed complete with costume, accessories or weapon where all the characteristics that are usually inspired from culture experiences for example local traditional clothing and sword used by the warrior represent the character’s stature . The rise of animation contents tends to drive them away from understanding what lies behind it that affect their emotion and thought. Keen’s, as cited in  put forward a claim that, the relationships between narrative fictions, emotions and empathy have received attention from many scholars that generally supporting the claim that ‘quality’ fiction leads to the development of ‘theory of mind’; human ability to comprehend other people beliefs and desires, that may differ from others. According to Raz & Hendler , empathy originates from the German notion Einfuhlung (inner feeling) created by Robert Visher in 1873. In Visher’s theory, he defined as the projection of human feeling toward external world, including aesthetic objects. The notion refers to situation in which what we feel something that occurs within our own body, but we attribute it to something outside of ourselves. From previous study, animation is considered as a visual display that relates to cinematic empathy. Previous study suggested that cinematic empathy is related to the role in eliciting a spectator’s emotional engagement with cinematic content and hardly be considered as esoteric or marginal issue in film studies. In order to investigate whether the character design aesthetics contribute to people’s perception and emotion, we conducted a questionnaires survey to 104 Malaysian at 2 HEI (Higher Education Institutions students located in Kuala Lumpur, Malaysia. 80 respondent ages between 20-23 years with majority 80.8% from multimedia academic background were selected for this particular study. The second population was 20% from 24-27 years old. A set of questionnaire were use consists of 9 items with categorical and five-point Likert scale session ranging from (1- Strongly Disagree to 5- Strongly Agree). Statistical analysis were performed in order to examine the difference characteristics in emotion and design aesthetics in animated characters. This study involved nine selected titles of Malaysian animated films with the character lineup to give an emotional responsiveness to the respondents. These animation films are Upin dan Ipin (2007), Bola Kampung (2007), Super Tots (2010), Boboiboy (2011), Dunia Eicak (2012), The Amazing Awang Kehnit (2014), Puteri (2014), Rimba Racer (2015) and Ejen Ali (2016). These titles are selected based on their popularities and highly praised from the Malaysian viewers. For examples, Bola Kampong (2007) became the first local animation win the Malaysian viewers heart and break into the international market broadcast network. In November 2007, it aired in 16 Asian countries over the Disney Channel . Upin and Ipin (2007), which became a huge phenomenon especially in South East Asian countries that shared similar cultures and language . Similar like Boboiboy (2011), a boy who became a superhero to fight aliens that is very famous among children. This title came into highlight when the fully animated film Boboiboy the Movie (2016) break the record and collected almost RM 14 million nationwide. Followed by Rimba Racer (2015) with their stylized designs and won many awards in Malaysia. Ejen Ali (2016) which is following the footsteps of Boboiboy (2011) that use superhero as a theme and has won Best Short Animated Film in Malaysia Film Festival in 2016. As a result, these animation products has led the way and give inspiration to many other local animation contents. The survey employed in this study is divided into three groups of questions that asked respondents perception on local animated characters, character design aesthetics and psychological effects towards animated characters. In order to estimate the result, first we will use a frequency table for three items regarding the respondent perception about selected case studies for this research purposes. Next, the Spearman’s rank correlation coefficient is used to determine the correlation between independent and dependent variables groups in this paper. The rank statistical tests, is conducted to examine three categories name as perception, character design and character design affects emotion. Correlation is a statistical method used to assess a possible linear association between two continuous variables. The stronger the correlation, the closer the correlation coefficient comes to 1.0. We will use the Spearman’s rank correlation coefficient to determine the strength of the relationship between two variables. Spearman’s correlation coefficient using Spearman’s rho (rs) for sample statistic . It is appropriate for non-parametric correlation test when ordinal variables is used. The correlation coefficient has been provided using data from statistical simulation collected from the survey questionnaires. The purpose of this paper is to identify an appropriate use of correlation to highlight the factors that related to character design aesthetics that evoke human emotion and to recognize empathy among Malaysian animation viewers. The analysis was performed in SPSS software and tested using correlation analysis. The goal of the current study was to examine the design aesthetics and perception from the animation viewers that affects the psychological experiences in encouraging positive emotions that determine the pleasantness feeling. The first data in Table 1 were analyzed in frequency table to show the differences between gender and age to obtain numbers of participation in this research. Table 2, indicate reliability analysis for Cronbach’s Alpha report. Table 1 and Figure 1 shows results from Spearman’s rho and scatter plot for two variables which is Like the design (M = 3.66, SD = .758) & Design is appealing (M = 3.93, SD = .958). For this particular analysis, it will identify perception from the animation viewers. Based on the statistical results, we found it is moderate correlation r =.306 based on the correlation formula 0.30 < | r | < 0.70 and range from -1 to +1 correlation. However, the results show a good indication level of significance which shows p = .002 (2-tailed) which is smaller than p < .05. We use the exact the p < .05 to determine our results, and reject H0 (null hypothesis) of the p-value if smaller than 0.5. If p >.05, we fail to reject the H0 (null hypothesis) and accept Ha (alternate hypothesis) if greater than 0.5, that indicates there is statically significant correlation between two variables. We conclude that there is moderate correlation and it statically significant between the respondents who loves local animation characters and agrees that Malaysian animated character is appealing. Further analysis in Table 4 is to identify the key factor that contribute to their personal preferences of why they like the characters in the animation (M = 2.93, SD = 1.30). The data revealed that character’s theme shows the highest percentage 41.3% (n = 43) compared to others. While data from character’s personality and character’s role appears to have a 22.1% (n = 22) and 20.2% (n = 21) that have not so much different percentage which strongly suggested that character personality and its role indeed play an important factor in animation films. Besides, the results can be related back to the “design of the character is appealing” which majority of the respondents strongly believe that characters in local animation is attractive in-term of the appearance that effects their viewers’ emotion. We believe character’s role and the personality is a vital element that related to the appealing factors that makes audiences feel close to the characters. Data from Figure 2 reveal the results about character design aesthetics in Malaysian animated characters. Based on the data presented in scatter plot, we found that the correlation between character traits and pleasantness feeling (M = 3.2, SD = .837) shows a lower and very close to moderate correlation. More evidence can be seen in Table 5, where by the correlation of r = .282 is considered lower correlation. Yet, the level of significant indicate p = .004 (2-tailed) has strongly demonstrate highly significant score based on p < .05. 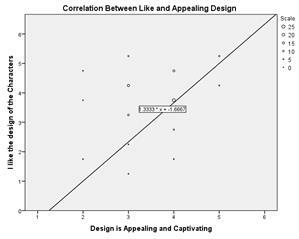 From this finding, we think the character traits and appearances and the feeling of pleasant towards character designs does have significant score and able to reject the null hypothesis. Here, we conclude that the alternate hypothesis is true and indicated enough evidence to accept that there is statically significant correlation between these two variables. Additionally, from the observation, we can suggest that there is a positive correlation between pleasantness feeling and excitement among respondents although the score of r is considered lower to moderate level. The strength of this paper is to highlight the importance of understanding human emotion towards local animated film characters. By examining the feeling of “pleasant experiences”, we tried to understand what lies behind their feelings that stimulate the sensational feeling of pleasure when watching local animated characters among Malaysian youth. Interestingly, the finding suggested moderate relationship (r = .306) on perception of Malaysian youth towards liking local animated character and do they think the design is appealing to them indicates that the quality of local animated characters has given some hedonic experiences to the local viewers. Secondly, we found that character’s theme is the key factor when associating with the appealing designs. The meaning of character’s theme in this study is more related to character’s appropriate costume, accessories, outfit designs, colors used, types of clothes and ‘wow’ factors that complement the character to fit in the story. Moreover, character’s role and the character’s personality portrayed in Malaysian animated film has given an impact to Malaysian viewers. As mentioned in literature, visual culture in some ways influences people’s knowledge, affects their construction and shape their aesthetics sensibilities. Selected animation titles that used for the purpose of this study are rich with visual culture elements that teach positive values to each other’s. Lastly, from the correlation study to identify whether character traits have anything to do with feeling pleasant and enjoying watching Malaysia animated character; we found the correlation is quite low (r = .282) but yet quite highly significant to shows that the correction between character trait also played an important factor that induce the feeling of pleasant among Malaysian youth. Thus, this study may be important for the exploration of relations between emotion and the animation content to the local animation makers. We try to extinguish how the viewers feel about local animated characters. By defining the importance of understanding animation viewers, it symbolizes an extended meaning to the animation makers and the animation industries to know their audiences. Malaysian animated makers’ needs to be brave enough to produce more animation with varieties of styles to specified viewers. Currently, most of the Malaysian animation contents aims for children viewers. With the exploration to different target audience, it may attract more Malaysian viewers to watch Malaysian animated contents. As mentioned previously, Anime and Disney are the most watchable animation contents in the world. Not only the animation has a good stories and beautiful character designs; it also offers animation contents that catered for all ages. Moreover, previous study also suggests that animation can positively influence viewers’ attention and increase consumers’ intention to purchase the animated brand . These include merchandising, packaging and products branding. Therefore, we hope that this study will benefit the creative content creators to understand how Malaysian animation viewers felt about local animated characters. In the end, digital creators must consider the impact on consumers' evaluations and considerations, ultimately, their satisfactions. This paper is part of author’s doctoral research sponsored by the Majlis Amanah Rakyat (MARA) and supported by the Universiti Kuala Lumpur, Malaysia. Shaliza. D, Nurhasliiza. A, Salmah.A, M. . (2014). Art Appreciation : An analysis of stylistic development of Malaysian. Online Journal of Art & Design, Universiti Teknologi MARA, Vol.2, 1–24. Keen, S. (2004). Empathy and the Novel. Oxford: Oxford University Press. Zaki, J., & Ochsner, K. (2012). The neuroscience of empathy: Progress, pitfalls and promise. Nature Neuroscience, 15(5), 675–680. https://doi.org/10.1038/nn.3085. Tillman, B. (2012). Creative character design. Massachusetts and Oxford: Focal Press. Sajjad, S., Mohsin, S., Riaz, S. & A. Abdullah. (2012): Enemy Character Design for Graphical Imagery Therapy (GIT) Game. International Journal of Information and Education Technology, 2, 4 (August 2012), 345–347. Hassan Abd. Muthalib. (2003). The influence of anime on Malaysian animation filmmakers. Paper presented at the International Anime and Manga Forum. Tokyo, Japan. Khor Kheng Kia. (2009). A study on the visual styles of Wayang Kulit Kelantan and its capturing methods. International Conference on Computer Graphics, Imaging and Visualization. Mohd Khalis Normah Mustaffa, F. (2017). Cultural inspirations towards Malaysian Animation Character Design. Jurnal Komunikasi Malaysian Journal of Communication Jilid. Hassan Abd. Mutalib. (2016). From mouse deer to mouse: 70 years of Malaysian animation (1st edition), Kuala Lumpur: Akademi Seni Budaya dan Warisan Kebangsaan (ASWARA).